The Occupational Training Center of Burlington (O.T.C.) is a dedicated, private, non-profit organization that provides jobs and vocational training for adults with disabilities. Our team of specialized experts and caring individuals supports adults with disabilities to help them succeed in the workplace. We work with several local organizations to identify needy individuals; the majority of our clients are brought to us through a referral process from such organizations as the Division of Vocational Rehabilitation (DVR), the New Jersey Commission for the Blind and Visibly Impaired, the Veterans Administration, and private insurance companies or area school districts. Our rehabilitation service is able to assist individuals in a valuable way and support the community at large. Once clients enter our program, we work closely with them and their family or guardians to develop a specific program tailored to their interests and goals. A special vocational evaluator will assist individuals in choosing and entering a vocational training program where they will receive guidance and support in developing job and life skills. In addition, we offer a number of programs in work experience. 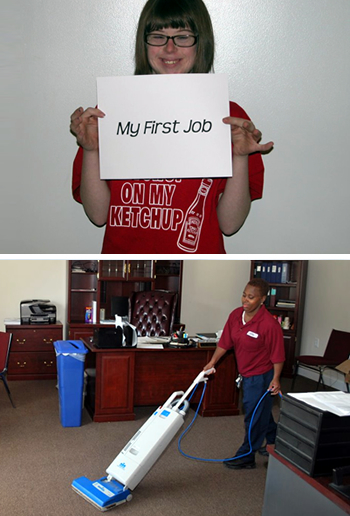 Our Supported Employment Program even assists interested individuals in finding employment outside of the O.T.C. Support and encouragement from a vocational case manager continue after employment, allowing the individual to adjust to working in the new environment. All of our working adults with disabilities benefit from a supportive staff and encouraging environments for both training and work. Our tailored approach has helped many adults with disabilities fulfill their goals. Every client is unique, and we’re invested in making each story a success. If you have any questions about a specific vocational or rehabilitation service or would like to know more about the referral process, contact Occupational Training Center of Burlington.